Pretty much like the last one except where you can see upper left, the irregular shaped area that has been masked in. 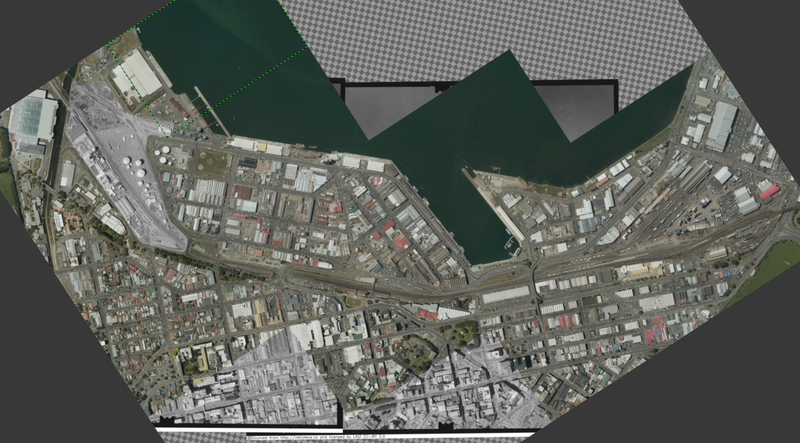 Bits you can see on the edges, on the other hand, are simply overhangs outside the Linz aerial tiles that won't appear in the finished result (the reason you can see them is because the canvas has a few blank areas on it due to the Linz images not taking up the full canvas). So maybe just another day to finish the masks then as per usual we spit out the tiles to load back into Qgis to draw the maps straight onto. And that's for 1978. I feel sure there will be older imagery available, so if 1960s or even 1950s comes out later on, I will do another generation, but I am not going to do multiple generations for such a large area as I have for a small number of station.